When Josiah Brown first came to Indiana University Bloomington, he was excited. Brown chose IU because it felt similar to the small town he came from, but ripe with opportunity and culture. But being on a campus of more than 40,000 students was a hard adjustment for Brown in the beginning. It took a little stepping out of his comfort zone, and a journey back to his love of theater, for Brown to make Bloomington the home he knew it could be. "The thing I like about IU is that even though it is such a big campus, it still has opportunities for everyone," he said. "You can really make IU whatever you want it to be." Sit down with Brown and it doesn't take long to see he is a man who likes to stay busy and a man who loves theater. Growing up in a small town outside Kokomo, Ind., Brown spent his childhood singing in the school choir. 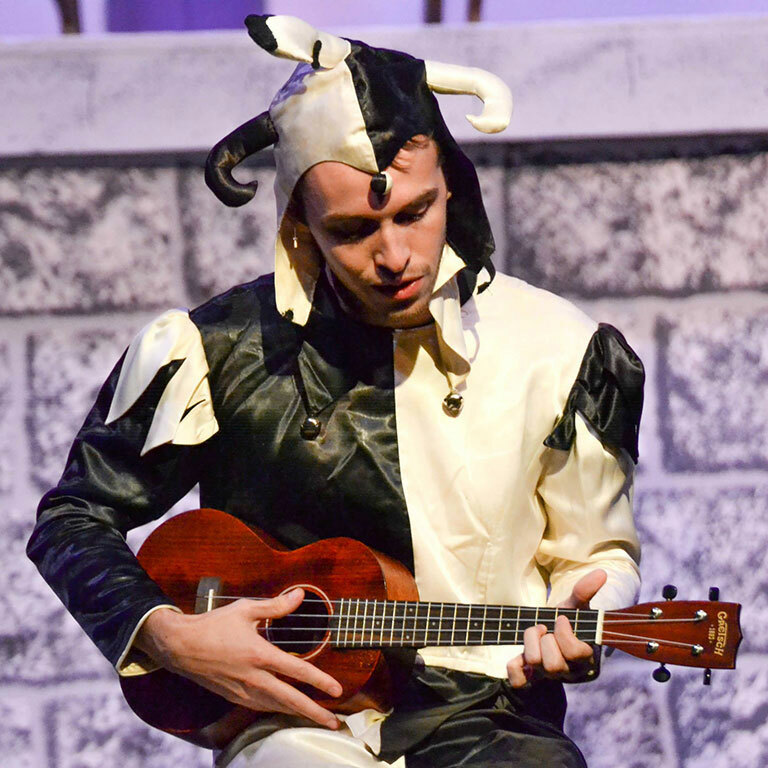 Brown performs in a production of "Twelfth Night." Photo courtesy of Josiah Brown. During his sophomore year of high school, he auditioned and won a small role in "The Woman in White," and as the old saying goes, caught the acting bug. "At first it was all about 'hey look at me,'" Brown said of performing on stage, "But then it became more about the live performance and being with your friends intimately on stage and creating art with people that you love." At first, Brown thought he would pursue a career in choir education and was accepted to a couple of university programs. But one of those programs was not at IU. Not ready to give up the idea of coming to IU Bloomington, Brown decided to follow in his mother's footsteps and pursue a degree in human biology. However, he couldn't quite give up acting so he enrolled in an acting class for non-majors. It didn't take him long to realize he was chasing the wrong dream. "When I got into the program I realized there were all these people who really loved science, and I was struggling to just get through the classes," he said. "I was really struggling to have fun and enjoy it." Brown spoke with his acting teacher who encouraged him to pursue theater. But instead of acting, Brown switched to the Theatre, Drama and Contemporary Dance stage management program. There he found his home. "It's kept me on stage without actually being on the stage," he said. "It's kept me involved in the process which is actually what I love about theater: creating the theater rather than putting the theater on." 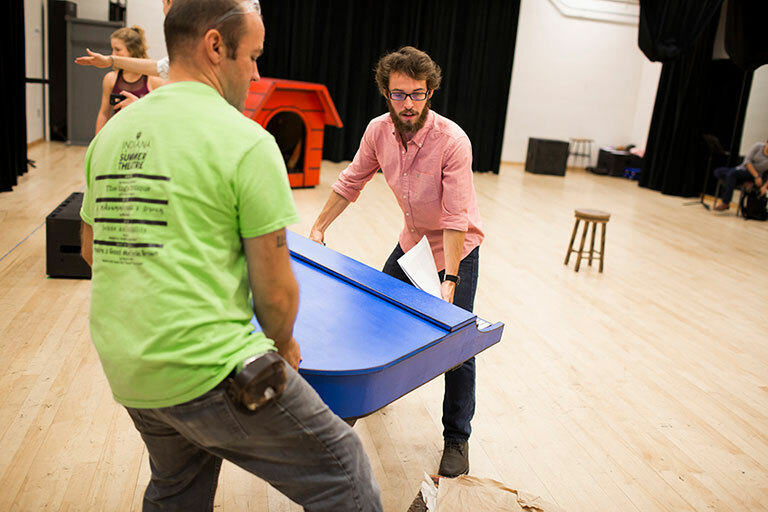 Brown, right, and Technical Director Jeff Baldwin place a prop piano on stage before a rehearsal of "You're A Good Man, Charlie Brown." Photo by IU Communications. As an assistant stage manager, Brown is tasked with making sure each performance goes off without a hitch, overseeing both the technical and artistic elements of a performance. That can include running rehearsals, making sure the director's vision is communicated to the props and technical team, calling cues, and making sure the actors are reading their lines correctly. In the past three years Brown has served as assistant stage manager for IU Theatre Department's productions of "Mr. Burns," and "Bloody, Bloody Andrew Jackson," and stage manager for Bloomington Playwrights Project production of "Toast." He also spent two years as technical director for University Players -- IU's undergraduate theater company -- and will serve as its production manager this academic year. He is currently serving as assistant stage manager for IU Summer Theatre's production of "You're a Good Man, Charlie Brown." Brown credits IU's theatre department and University Players for allowing him to open himself up to new things and to be more outgoing. "UP has been dear to me since I got here," he said. "My freshman year I had no idea how to talk to people. UP was the first (theater) company here to give me an opportunity and it was UP that helped me make friends and realize these people are all in the same boat as me." When he is not involved in theater, Brown is keeping busy in other ways. He takes an average of 21 credit hours a semester, minoring in Spanish and physics and earning a certificate in arts management. He also hosts a weekly radio show -- "Benny and Josiah Like the Radio" -- at IU's student radio station WIUX, works out regularly at IU's Student Recreational Sports Center and loves to visit unique restaurants and landmarks in Bloomington. He'll maintain that busy schedule this upcoming academic year, serving as production manager for University Players' productions, stage manager for IU's performances of "Florencia En El Amazonas" and "The Duchess of Malfi" and director of "Ghost Quartet" for University Players, and will likely serve as stage manager for one of Bloomington Playwrights Project's performances. 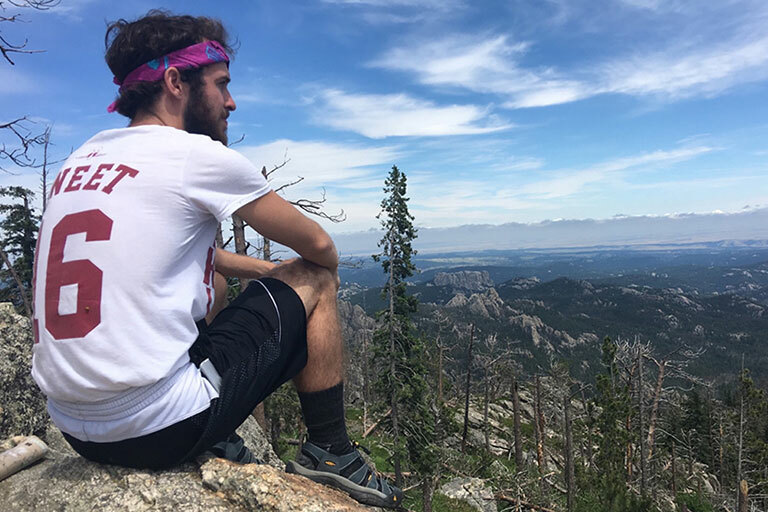 Brown, who loves to travel, at Harney Peak in the Black Hills of South Dakota. Photo courtesy of Josiah Brown. After graduation, Brown will serve an internship as a production manager's apprentice at Broadway's Roundabout Theatre company. He's still teetering between entering the workforce immediately after that experience or taking some time to see the world. He recently spent two months traveling through Southeast Asia, mostly alone, and plans to visit Vietnam this winter. But wherever life takes him after IU, Brown is happy for his experiences here and the growth he has made during his time at IU. "When I first came here, I fell in love with Bloomington because it had all this culture and heart, compared to everywhere else I was planning on going," he said. "Everyone here was so friendly and it reminded me of my home and my family. I thought this is where I could have my home away from home, and it is."